Though our address is 1393 North Highland Avenue, we are actually located behind the shops that face N. Highland (Highland Runners, Highland Diamonds, Sorrell Boutique). 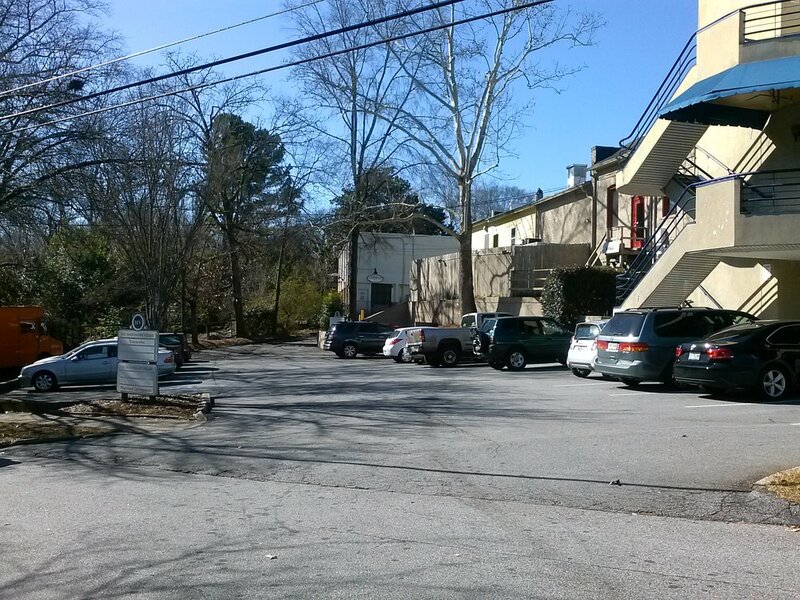 You can access us from N. Highland Avenue by a driveway found to the right of Sorrell Boutique. You can also access us off of Lanier Blvd. You'll first see Fit Learning and Pierce Chiropractors on the right as you pull into the parking lot. Look straight ahead and you'll see the side of our building. Keep driving through the first parking lot, even though it looks like the driveway ends. It continues and you can park just steps away from our front door. Please call us if you have any trouble finding us! The view from Lanier Blvd. access. See the side of Casseroles straight ahead in the photo. Additional parking lot in front of the shop…keep on driving through this first parking lot. To 30306, (Monday-Friday), We offer free delivery and are able to deliver dishes that are frozen, thawed or “hot and ready to eat”. Please call us prior to 2:30 p.m. for same day delivery. For all other areas (Monday-Friday): We use a delivery service, Roadie and can deliver frozen or freshly made dishes. Roadie commonly delivers within a 2 hour window — therefore, we discourage having a delivery of hot items because we can’t guarantee the exact time it will arrive to you. The cost of Roadie varies a bit but the average is about $12.00-$14.00 inside the perimeter and $18.00-$20.00 outside the perimeter. We will confirm the cost when you place your delivery order. Thank you so much! To arrange for delivery, please give us a call (404.228.3260) prior to 2:30 p.m. for same day delivery.